4. Where Can I Go Without You? Customer Reviews (5.00 Stars) 18 person(s) rated this product. This album is remarkably perfect. Form the bite in the strings to the "in the room" presence of Nat. What can't they all be like this? This record is truly a breathtaking example of what this medium is actually capable of. Like with all of Analogue Productions' records, they are simply stunning. Don't give this a second thought if you like Nat King Cole. I'd give it 6 starts if I could! Obviously done by someone who had their heart in their work. A delightful record - fabulous sound. The quality convinced my wife to allow me to upgrade my turntable - must be good !! This is an awesome recording! Mr Cole's music is a wonderful heritage and thanks to Analogue Production we now can enjoy the music in the absolutely best conditions. 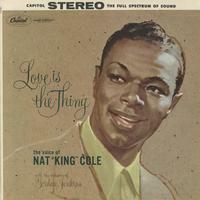 I thought I knew Nat King Cole's recordings well, how wrong was I? Nat's vocal nuances and sheer variety of intonations have been revealed to me truly for the very first time. I'm staggered by this recording, it is so completely real. Congratulations to all the engineers involved with this 45rpm pressing for achieving such superb results from the master tapes. Well done!!! Actually have not heard LP yet but based on previous Nat King Cole 45 RPM LP set I can only imagine! If you like to have one demo LP (and you can easily switch to 45rpm) this is the one! Although I have not listened to this album I would like to comment on the packaging. This is my third order I have placed with 'accoustics' and by far the best packaging I have had. The album made it down here(New Zealand) in perfect condition. Thanks for the outstanding shipping. This gives me great confidence in your ability to ship more expensive items that I would not hesitate to now order. I have to admit that I've never purchased a Nat King Cole album before. I bought this based on reviews and a listen to samples on Amazon. It arrived in a box with a couple of other records I'd bought, so I thought I'd put it on the turntable first and listen to one side before I listened to the others, just to see what all the fuss was about. Well I ended up listening to the whole thing and forgot about the other records. As soon as the music started, it sounded amazing. Cole's voice is unique and the recording has him centred and forward. In fact he was so far forward, I had to adjust the toe in on the speakers after the first song as I was just about rubbing noses with the guy! His voice is solid and "real". The orchestra is absolutely silky smooth, fluid and luscious. The mastering is superb with lovely detail, but warm at the same time. If you're a fan of Nat King Cole, then this is a must have. If your not, then listen to samples of the album. If you think "not bad", then get it! This is as good as it gets. I hope all the new Nat Cole releases are this good as I about to order several more. Like Being In The Studio! Seriously, this is as close to being there as you can get. The clarity, immediacy and presence of Nat and the orchestra has to be heard to be believed. The only thing that could have bettered an already legendary performance was a meticulous first class transfer of the original source material, and this LP delivers! Mr. Cole is in the room! It is almost an eerie experience listening to this LP the first few times. Someone else said it but it bears repeating..."I don't want to say that Nat is in the room with me, but I mixed him a cocktail and offered him an ashtray!" This is nothing short of sonic beauty. You THINK you know this album? You won't until you own this 45RPM edition. Simply amazing with breathtaking quality. A release for the ages! WOW!!!!! This is the reason that I am addicted to analog recordings. I've never heard Nat King Cole any better than this. He was simply standing in my room with his full orchestra. Unbelievable stuff.